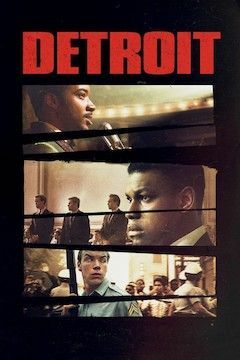 A police raid on an illegal bar sets off the 1967 Detroit riot, one of the deadliest incidents of civil unrest in the history of the United States. With the whole city on edge, gunshots are heard coming from the Algiers Motel. Security guard Dismukes (Boyega) responds to the disturbance alongside fellow police officers and National Guardsmen, who shoot out the building’s windows and storm the entrances. Three civilians end up dead, and several others are beaten, leading to an escalation of violence that permanently alters the lives of everyone involved. After a police raid on an illegal bar set off the deadly 1967 Detroit riot, shots are heard coming from the Algiers Motel. When police, National Guardsmen and a private security guard respond three black men end up dead and several civilians are beaten.